The strips are packed in quantities of 50 and are packed in a polythene bag as the right hand picture shows. 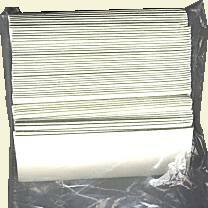 A fold of card is stapled over the folded top end of the bag. This card has details on the rear that are similar to the white paneled illustration below. The pictures on the Czech version are in black and white, the coloured ones are due to a bit of my artistic licence, but mimic the originals. The strips are impregnated with an oxygen producing chemical and they smoulder in a repeatable and controlled manner, at a temperature that is suitable for the evaporation of the chemicals concerned. It is possible to dribble various medicaments on the strips for the varroasis control ( keep the instruction about doses as given in the individual medicaments instruction sheet ). Fire is set on the lower edge of strips. Strips are to be hung inside the hive in a vertical position. The text in the above panel has been adjusted for an English speaking readership, but some of the quaint translation has been left to give the 'flavour' of the original. The strips must only smoulder, if they flare up they must be blown out.